What’s the ‘Pink Tax’ Anyway? Several economic studies have confirmed the existence of a so-called “pink tax,” an inflated price attached to goods and services specifically marketed to women. While theories abound to explain the pricing discrepancy, its existence seems clear. On everything from razors and deodorant to car repair and haircuts, women are expected to pay more for products marketed directly to them. In many cases, marketing is where the differences stop. It may seem like pennies, but across the board, these pennies add up. One study by the University of Florida found that women end up paying about $1,400 more per year. This invisible tax is taking money out of your pocket. Want to get it back? Here are some ways you can avoid the pink tax. Personal hygiene products are among the biggest contributors to that $1,400. Items like lotion are rebranded as “facial moisturizer” and packaging with floral designs. The “moisturizer” sells for 7-8% more than the “lotion.” The functional difference between the two products? In most cases, absolutely none. When there is a difference, it’s usually in perfume. The worst culprit of the flowery-smelling foul play is deodorant. Men’s and women’s deodorants all have the same active ingredients, usually in the same ratios between brands. A stick deodorant is a stick deodorant until it comes time to scent it. Floral-scented deodorants sell for as much as a dollar more than their muskier counterparts. No one wants to smell like a man (even many men). So what’s the answer? Look for scentless or perfume-free personal hygiene products. Not only are they cheaper, but the lack of chemical perfumes can be better for your body in the long run, too. If you miss the floral aromas of your old products, consider purchasing essential oils in similar scents. You can add them to lotions and deodorants yourself at home for a fraction of the cost and keep a closer eye on what you’re putting on your skin. When in doubt, check the ingredients. Compare your usual to a comparable male product. If there’s a reason for a gender difference, it’ll show up here. In most cases, the active stuff is all the same. The most flagrant example of the “pink tax” has to be in razors. No difference exists between razor cartridge replacements for men and women except the color of the packaging. 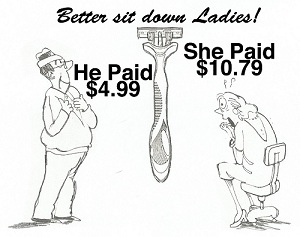 Yet, a 4-pack of Venus razors costs $4 more than a 4-pack of Fusion razors. They’re the same razor, made by the same company. The only difference is the more expensive one is pink and the cheaper one is blue. It’s not just razors, though. Toys, like scooters that are marketed to children, can vary wildly in price depending upon their paint job. One retailer listed blue childrens’ scooters for $24.99 and an identical pink scooter for $49.99. Incontinence aids marketed to men contained twice as many pieces as the same product marketed to women. Either in quantity or in cost, pink packaging costs quite a bit! Women frequently encounter what one economist calls the “pink expectation.” Most products for men are imagined to be the default, so products for women must be modified in some way to make them more acceptable. Even when there’s no difference in the product, the expectation is used to justify the increased cost. Manufacturers have been exploiting that expectation to make money on the backs of women for years. Where possible, look for gender-neutral or generic brand products. For razors, especially, the only possible differences are number of blades and level of lubrication. If it has the same number of blades as the razor you’re currently using, you can use more shaving cream or soap (another popular target for the pink tax!) to increase your comfort. Perhaps the most surprising place for price differences to occur is in the service industry. Dry cleaners, auto mechanics and hair stylists are getting away with charging more to women than to men. What can be done here? For some industries, justifications may exist. Dry cleaners may need to take more care around adornments on women’s clothing, and stylists may have more hair to deal with. In these instances, it’s best to take the justification head on. Women with short hair should ask for the men’s price and cut. Bring a mixture of men’s shirts and women’s shirts to the dry cleaner and ask the counter staff to explain the pricing difference. In many instances, service providers value your business more than they value an artificial markup. Where possible, though, remove gender from the equation altogether. Buying cars via email using a gender-neutral signature, like the first letter of your first name, can result in more fair haggling practices. Getting quotes and estimates from mechanics via text message can discourage them from attempting to artificially inflate their bills. Finally, if you see an instance of biased pricing like this, let others know. Let businesses that do these things know that it’ll end up hurting their bottom line in the long run. By frequenting establishments that don’t practice this kind of discrimination, you can help end the “pink tax” for everyone. Connect with us for other financial tips and tricks on Facebook, Twitter, and Instagram. Going through the daily motions of life, you may never have time to think about the reasons for which you’re earning money. Very few people are getting up and punching the clock every morning with the hope of building a Scrooge McDuck-style money room. Most of us are trying to put food on the table, ke ep the lights on and provide for our loved ones. Those things are our priorities. 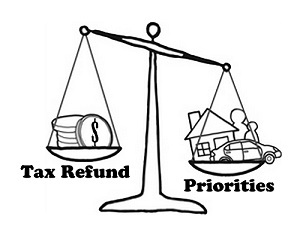 If you need help reaching your savings goals, Section 705 Federal Credit Union can help. There are many ways you can automate your savings and assist in keeping you on the right track. Call, click or stop by the credit union today!